A horror icon: Boris Karloff stars in ‘Frankenstein’ (image credit: Universal Pictures, used for illustrative purposes only). Adapted from the play by Peggy Webling which was based on Mary Shelley’s novel (Frankenstein: Or, the Modern Prometheus, first published in 1818), director James Whale’s Frankenstein is rightly considered as one of the all-time greatest horror films and followed hot on the heels of the success of Universal Pictures’ Dracula. Drawing from the themes of Shelley’s literary masterpiece and presenting them visually in a visceral and horrific manner, Frankenstein delivers atmospheric chills and thrills with memorable performances, inventive production design and incredible character make-up all shepherded under the meticulous direction of James Whale. Leading the cast is Colin Clive as Henry Frankenstein, the young scientist obsessed with reanimating the tissues of the dead and whose grave-robbing endeavours lead to a monstrous creation. Clive tackles his role with an intellectual intensity that although for the most part is restrained, bears fruit when Frankenstein erupts into bouts of manic joviality as he celebrates the success of his experiment. Clive is ably supported by Dwight Frye as Frankenstein’s deranged hunchback assistant, Fritz, Mae Clark as his fiancée Elizabeth, John Boles as Victor Moritz and Edward Van Sloan as Doctor Waldman. 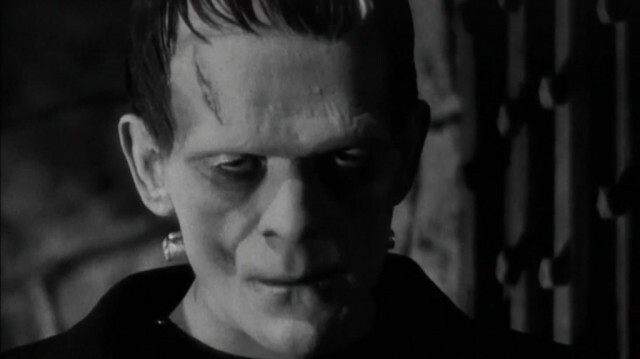 However, it is most certainly Boris Karloff that makes Frankenstein truly unforgettable. In a departure from Shelley’s original work, this version of Frankenstein’s ‘monster’ is simple minded and beastly, yet childlike. Aided by the iconic make-up design (created by Jack P. Pierce, who is sadly uncredited), Karloff brings all of those qualities to life – the wonderfully awkward, stumbling physical performance and animal-like whines and groans conveying a real sense of tragedy and the creature’s yearning for acceptance. It makes for numerous standout moments and especially effective in the monster’s lakeside encounter with a young girl that surely ranks as one of the most startling and impactful in the history of cinema. Karloff would of course return for 1935’s Bride of Frankenstein (and second sequel Son of Frankenstein, released in 1939) after appearing in The Mummy in 1932. James Whale would also continue his association with Universal’s classic horrors, helming The Old Dark House (which also stars Karloff) and The Invisible Man before reuniting with Boris Karloff for the aforementioned Bride of Frankenstein. No analysis of Frankenstein is complete without mention of Charles D. Hall’s art direction, chiefly the sets for Frankenstein’s castle – the twisted, sloping stone walls evoking a sense of madness and foreboding whilst the levers, dials and instrumentation furnish the laboratory with intricate detail that together with the bristling arcs – and sparks – of electricity deliver a feeling of raw energy and tactile authenticity. Whilst some might find it all a bit quaint by today’s standards, there’s still an undeniable power to Frankenstein that on a cold and wintry evening can effortlessly captivate the viewer and formulate suspense in a way that most modern horror films cannot replicate. Dracula star Bela Lugosi was originally set to play the monster in Frankenstein but ultimately dropped out, leading to the casting of Boris Karloff. Lugosi would go on to portray Igor in Son of Frankenstein. Bride of Frankenstein : Colin Clive and Boris Karloff reprise their respective roles for James Whale’s poignant and darkly comic sequel which boasts an iconic turn from Elsa Lancaster as the titular “Bride”. Young Frankenstein : Mel Brooks’ beloved comedy is more an affectionate homage than a straight-up parody that features one of Gene Wilder’s finest performances and is further legitimised by the use of original props from Frankenstein. The Devil is back as Charlie Cox returns for season 3 of Marvel’s ‘Daredevil’ (image credit: Marvel/Netflix, used for illustrative purposes only). Just as Netflix announce the unfortunate cancellation of Marvel shows Iron Fist and Luke Cage, their first hit series returns for its third season. 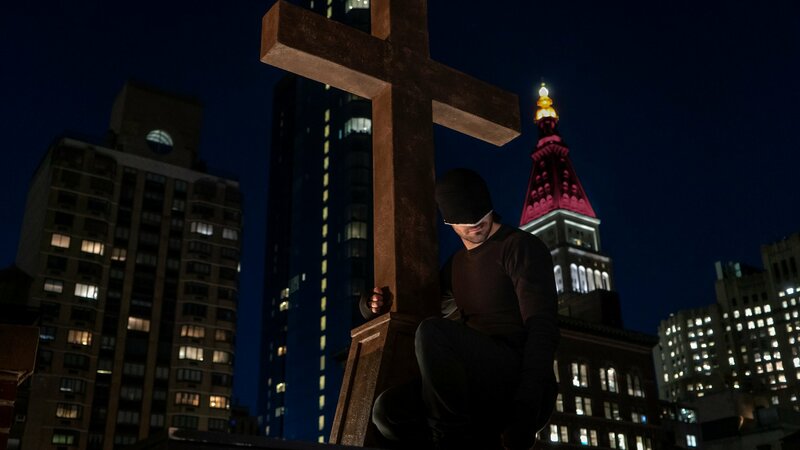 Daredevil is arguably the best of the Netflix/Marvel ventures and the premiere for its new season takes an expectedly slow-burn approach that is non-the-less an interesting beginning. In the wake of The Defenders, the final moments of which we learnt that Matt Murdock somehow survived the devastation of his final battle with the Hand (and how he escaped death is revealed but not dwelt upon), “Resurrection” finds Murdock broken, worn down and in the care of Sister Maggie (Joanne Whalley) as he attempts to recover physically and spiritually. His senses dulled and his soul crushed, it’s been a bumpy road for Murdock who feels he only has purpose as the Devil of Hell’s Kitchen and it’s time to emerge from the torment of his own personal damnation. Charlie Cox, as always, is great and we feel every inch of Matt Murdock’s pain in mind and body. Cox’s scenes with Joanne Whalley are a particular standout as Murdock bears his soul to the Sister who was a mother figure of sorts to the once young boy who had just lost his sight and his father. There’s also guidance and support from Peter McRobbie’s Father Lantom which adds further dramatic layers to Murdock’s struggle. Meanwhile, Karen and Foggy continue to deal with the aftermath of their ‘loss’ albeit in different ways – Karen holding on to the hope that Matt is alive and will return, whilst Foggy has chosen to accept that his best friend is gone and move on with his life as best as he can. Although Deborah Ann Woll and Elden Henson don’t get a whole lot to do in this episode, both actors slip back into their roles with ease and are as effective as they’ve ever been. Daredevil would of course not be the same without Vincent D’Onofrio as Wilson Fisk and “Resurrection” makes room to revisit the deposed Kingpin, dejected as he continues to languish in prison. D’Onofrio is reliably intense and it seems Fisk is being positioned for a powerful comeback that will undoubtedly once again draw battle lines on the streets of Hell’s Kitchen. Visually it’s the usual high standard for Daredevil, the use of sound and lighting married with beautiful photography giving the series that cinematic quality we’ve come to expect and appreciate. The fight choreography is also top-notch and is quite brutal, but with dramatic resonance – especially in those scenes in which Murdock submits himself to a sparring match in an attempt to re-focus his senses. Ultimately it is a slow start, which is par for the course with the Marvel/Netflix series, but writer Erik Oleson (who replaces Marco Ramirez as showrunner) puts the pieces firmly in place and sets this latest chapter of Daredevil on a thematically interesting path. The bottom line: the latest season of Daredevil gets off to an interesting start with strong acting performances, engaging character work and rich visual aesthetics. All 13 episodes of Daredevil season 3 are available to stream now via Netflix. ‘Superman’ #4 features another striking cover from the art team of Ivan Reis, Joe Prado & Alex Sinclair (image credit: DC, used for illustrative purpsose only). Brian Michael Bendis continues with his run on Superman and it’s another solid issue that’s pacey and action packed whilst offering some emotional investment that helps to ground the Man of Steel and reinforces the positive values of the character. Picking up on previous issues, Earth is trapped inside the Phantom Zone and Rogol Zaar has partnered with Kryptonian traitor Jax-Ur and assembled an army of the Zone’s most powerful and deadliest prisoners to take on Superman and prevent him from saving his adoptive home and its denizens. Naturally, this all provides very high stakes for Krypton’s Last Son and Brian Bendis keeps the pressure on and the tension ramped up. It makes for an entertaining read that’s for sure but Bendis still takes time to focus on character and intersects the action with a flashback to a key moment with Jon in which he imparts an important moral lesson to his son – namely that despite what he may be capable of, sometimes intellect is more important than might. In turn, this memory inspires Supes to calmly assess the situation in seemingly dire circumstances and find the best course of action to achieve a more effective outcome. The story also features the inclusion of Superman’s Justice League colleagues and there are some fun scenes with Flash and the Atom as they work desperately to keep things together on the ground and aid the effort to free Earth from the Phantom Zone. As for Rogol Zaar, there’s still some work to be done as we really don’t know a whole lot about him, we’ve had glimpses of his background and motivations but a shroud of mystery remains. Zaar is still a decent enough villain and provides a palpable sense of threat but hopefully Bendis will get to delve deeper into the character’s backstory and how it connects to the destruction of Krypton – if he is indeed responsible (we know the why, we just don’t know the how yet). Ivan Reis once again provides great visuals (together with his collaborators on inks and colours) bringing powerful and epic layouts that elevate the blockbuster action sequences in Bendis’ script. There’s almost a Bryan Hitch style widescreen quality to it but Reis’s talents are equally effective in the smaller more character orientated moments where he proves deft at conveying a wide range of feeling via intricate facial expressions and body language. Along with his work on Action Comics, Brian Michael Bendis is building an enjoyable run on one of the greatest comic book superheroes that has great potential for the future. The bottom line: Another good issue from Messrs Bendis and Reis, Superman #4 is an entertaining and at times insightful read that reassures fans that the Man of Steel is in the right hands. Superman #4 is published by DC and is available in print and digital formats now. A bold new era for the Doctor? The Doctor (Jodie Whittaker) prepares for new adventures (image credit: BBC, used for illustrative purposes only). The Doctor is back and she is magnificent. Ever since the reveal of Jodie Whittaker’s casting as the successor to Peter Capaldi’s Twelfth Doctor, there have been passionate debates – both for and against – among Doctor Who fans and the wider geek community as to the merits of the series moving in such a potentially controversial direction. Would Whittaker merely be in place to ‘modernise’ the show or would there actually be creative merit in having the Doctor flip genders? The answer to the above really is that it doesn’t matter, nor should it ever have – Doctor Who is all about change and exploring the new, something that – particularly in its contemporary iteration – the series has always achieved without sacrificing the core tenets of the franchise. 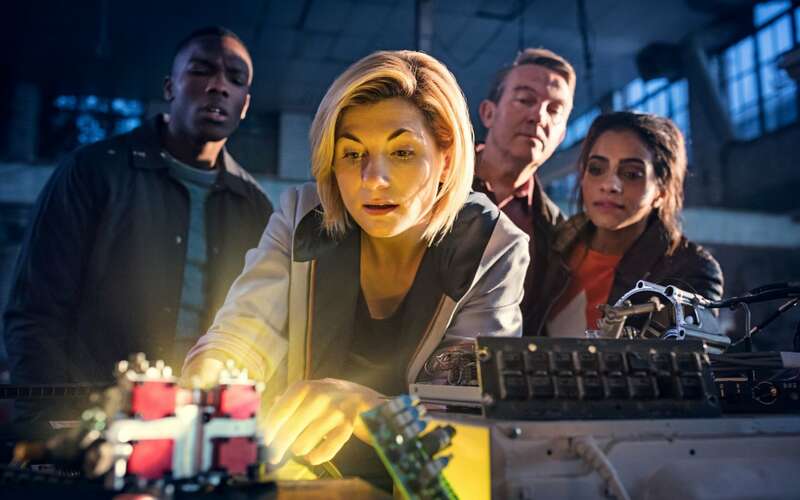 With new showrunner Chris Chibnall (who has previously written for post-2005 Doctor Who, including the 2010 two-parter “The Hungry Earth”/”Cold Blood”, which reintroduced the Silurians) onboard and a new leading star, “The Woman Who Fell to Earth” injects Doctor Who with fresh energy in a fun, yet dark and surprisingly mature adventure that sets up a new era for the series without straying too far from the familiar path. There’s something comforting and reassuring about Jodie Whittaker, from her first scene she takes charge of her role and delivers a performance that evokes all the qualities we’ve come to expect from the Doctor – quirky, heroic, ingenious and wise, yet fallible. The Doctor may be an alien but there’s always been something very human about the character and Whittaker delivers that along with her own subtle twists (including that Yorkshire accent) that will no doubt continue to develop over the course of the season. Aside from the Doctor herself, “The Woman Who Fell to Earth” introduces us to a whole new TARDIS team, each with their own distinctive voices and set of traits. The group comprises: Tosin Cole as Ryan, whose challenges with Dyspraxia frame the episode and is dealt with in a commendable manner, Bradley Walsh as his grandfather (by marriage, presented without any unnecessary fuss), Graham and Mandip Gill as Yasmin (“Yas”), a bored junior police officer who’s also Ryan’s former school mate. There’s some concern that an enlarged roster of companions might prove troublesome but let’s wait and see. Chris Chibnall’s script is straightforward, whilst there’s a central threat in the form of the Predator-esque Stenza – an alien warrior the Doctor hilariously misunderstands and calls “Tim Shaw” – the story is relatively unencumbered and narratively uncluttered allowing Chibnall to focus on character. What’s most pleasing is that Chibnall never presses the point that the Doctor is now a woman, there are one or two necessary lines addressing the fact but otherwise the script allows Whittaker to get on with just being the Doctor…and that’s what it’s all about. We do get the usual post-regenerative antics as the Doctor settles into a new body (and Chibnall produces some great dialogue that helps express what all this means to the Doctor that analogises the series itself – the same, yet new and somehow different) but it’s enjoyable and doesn’t significantly weigh down the plot. Combined with Jamie Childs’ direction, Segun Akinola’s music (succeeding Murray Gold as Doctor Who’s chief composer) and a wider visual aspect, “The Woman Who Fell to Earth” has a cinematic quality to it that along with decent writing and Jodie Whittaker’s portrayal demonstrates potential for this new era of Doctor Who. The bottom line: Jodie Whittaker impresses as Doctor Who hits the ground running with a promising new start to a beloved staple of SF TV. Doctor Who airs in the U.K. Sunday nights on BBC One and can be seen in the U.S. and internationally via BBC Worldwide services. What did you think of the Doctor Who season premiere? Share your thoughts below! Tom Hardy stars in ‘Venom’ (image credit: Sony Pictures/Marvel Entertainment, used for illustrative purposes only). Released to scathing critical reviews, Sony Pictures’ Venom is actually a fun popcorn flick that’s not nearly as awful as those opinions would have you believe. It’s not the greatest comic book film adaptation you’ll ever see but much like Warner Bros/DC’s Suicide Squad, Venom manages to hold itself together and navigate its flaws to simply entertain, viewed with the right mind-set. Seen as the launch pad for Sony’s Spider-Man spin-off cinematic universe (the rights to the iconic web-slinger currently being shared with Marvel Studios), Venom sees star journalist Eddy Brock (Tom Hardy), having lost his job and his fiancée, becoming bonded with an alien ‘symbiote’ allowing him to transform into ‘Venom’ – the popular Marvel Comics anti-hero (originally established as one of Spider-Man’s most lethal foes) created by Todd McFarlane and David Michelinie. Previously brought to the bring screen in Sam Raimi’s Spider-Man 3, Venom’s Spidey-less origin is likely to be the most controversial element of this new adaptation. The ever reliable Tom Hardy (who was a powerful and imposing presence in The Dark Knight Rises) is Venom’s biggest asset with a committed and kooky performance that walks (and sometimes hops over) a delicate line between dramatic and darkly comedic. Like the tone of the film itself, it comes across as a little odd and unsure at first but Hardy somehow makes it work and once Venom comes into play (whether as a voice in Brock’s head or in fully formed symbiosis with his host) the lead star clearly begins to have fun with it all. In fact, it’s the ‘relationship’ between Brock and Venom that’s the most enjoyable aspect of the film. Rogue One’s (and another of Britain’s own) Riz Ahmed brings a decent amount of menace to the central villain, Carlton Drake – entrepreneurial head of the Life Foundation, whose latest space mission brings Venom and other fellow symbiotes to Earth and Michelle Williams does well enough in an otherwise thankless role as Brock’s former girlfriend, Anne Weying. The rest of the supporting cast and ancillary characters (including Jenny Slate as a Life Foundation scientist) are less noteworthy but serve their parts non-the-less. 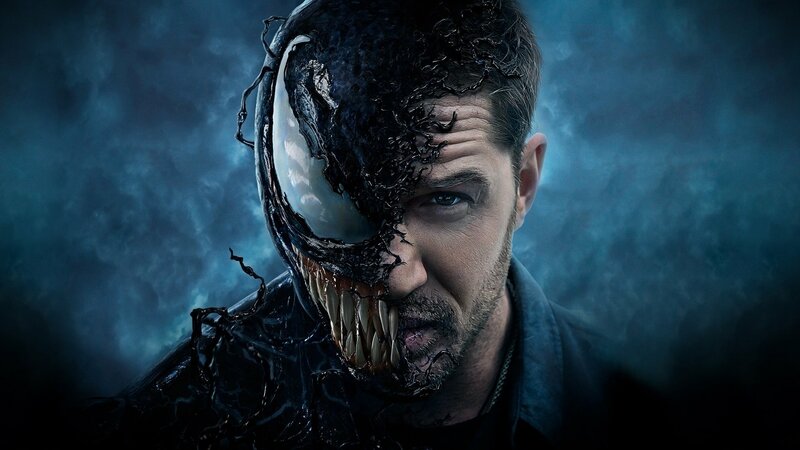 The CGI is fine for a film of this level of budget (around $100 million) but the script can be a bit drab (and a little problematic as it tries to deliver tonal cohesion) with some generic characterisation and occasionally silly dialogue yet it provides and despite a slow-burn opening act, Venom soon begins to move along at an entertaining pace. Ruben Fleischer’s direction does the job although the action scenes can be a bit muddled, falling into the trap of nauseously fast camera movements and quick edits. It makes for a somewhat jumbled climax as Venom faces off against the rival symbiote known as ‘Riot’. In the end, Venom feels like an old school comic book film that pays homage to those early McFarlane/Michelinie stories and coupled with Tom Hardy’s portrayal there’s enough to have a good time with. It’s not a perfect start but there may actually be potential for these Sony produced Marvel outings after all. The bottom line: Not without its drawbacks, Venom turns out to be a fun and undemanding slice of comic book action that’s worth checking out. What did you think of ‘Venom’? Share your thoughts in the comments section below!